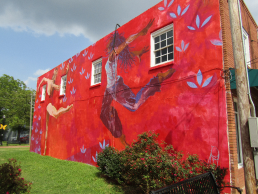 The Hapeville Mural projects are an initiative of the Hapeville Main Street Board and the Hapeville Arts Alliance. The Murals are intended to create a lasting visual impact in downtown, a symbol of the City’s commitment to downtown revitalization. Atlanta-based artist Charmaine Minniefield pays tribute to Hapeville's first African American business owner, Marjorie Protho. Protho opened her very first business as a florist in Hapeville and Minniefield's mural captures her story in a vivid, brightly multi-colored mural. For more information on the Minniefiled and her ongoing project, please click here. Hapeville is recognizing the arts as a tool for revitalization and economic development in a very big way. In collaboration with the "Think Greatly" initiative, artist Lauren Pallotta Stumberg creates this vibrant and powerful piece. Stumberg received a 2016/2017 Emerging Artist Award from the City of Atlanta. She also serves as an artist voice on the board of C4 Atlanta and leads beautification efforts as a board member at large for Fourth Ward Neighbors Association. **Funding for this project was provided by The City of Hapeville Main Street Board, Hapeville Public Works and Fulton County Board of Commissioners. For more information and photos of the mural, click here. Jay Wiggins created the Evereman Project as a away to give art back to the community. He began working in Atlanta in 1981 as a guerilla street artist and too that passion into creating a form of art about co-creation and collaboration, and about giving and creating before taking and profit. 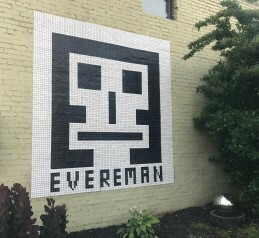 You can find Evereman art all over the world, including right here in downtown Hapeville! You can see more of Evereman by clicking here. In August 2012, you may have noticed the glance of “Mona Lisa” by Italian master Leonardo da Vinci, looking down on S. Central Avenue. Upon the completion of the "Hapeville Celebrates the Arts" Mural, several other noted pairs of eyes have downtown Hapeville within their sights! 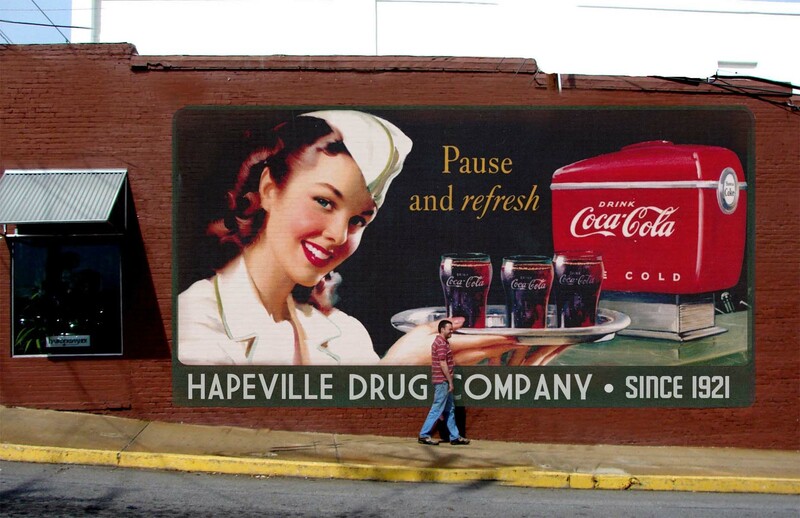 Artist Shannon Lake, photographed at work, completed The Hapeville Arts Mural that was commissioned by the Hapeville Association of Tourism and Trade, in partnership with the Main Street Program. The mural design depicts a collage of details from numerous noted works of art throughout the ages. The artist was seen painting by day and night high above S. Central Avenue on the rear of the 500 block, just opposite Memorial Garden. 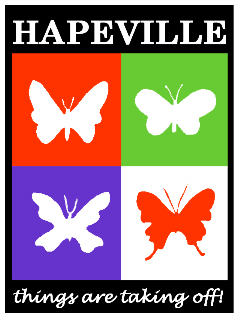 For Hapeville public art project information call 404.669.8428. To see the mural when it was "in progress" visit the artist's website: Click Here. 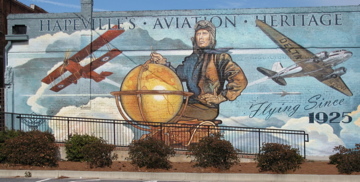 Hapeville’s Coca-Cola & Aviation Heritage Murals completed in 2010 and 2011. (404) 669 - 8269. To view the Hapeville Mural Ordinance please click on the link below. See our new page about Phase II of the Project! The Main Street Board unveiled its “Things are Taking Off” Butterfly Public Art Project in 2008. This type of project is a proven concept of introducing public art to communities nationwide. Programs of this nature have been launched successfully in Georgia (ex. Sandy Springs Turtle Project and Athens Dawgs Project) garnering much media attention, community support and auction proceeds to fund future public art projects. In addition, this project is intended to create a visual impact/improvement to downtown, a symbol of City’s commitment to downtown revitalization; to create community involvement—including residents, and local school children; to draw visitors from outside of Hapeville; and to introduce temporary public art to the City. Why did we choose butterflies? The Board, lead by the Design Committee, felt that the strong link between butterflies and metamorphosis can be a symbol of the revitalization of our downtown. Local high school student art classes and professional artists were hard at work for months painting the butterflies in partnership with the City’s Main Street Board and Cowpainters, Inc., a company that specializes in creating blank art forms for installation in communities. Use the "Installations" navigation at left to learn more about Phase II of the project! The Main Street Board began work on its public art Bench Project in 2007. In keeping with the Board's mission to assist with the revitalization of the downtown corridor, the Board's focus for the public art project was that of visible impact to the Main Street District. What a better way to introduce seasonal seating along the downtown sidewalks, than with seasonal benches! The project was led by the Design Committee in partnership with local middle schools and professional artists. The theme or subject matter supplied to the artists was the four seasons: winter, spring, summer and fall. As you stroll through our downtown we hope you will take a seat and enjoy the seasons! This project was updated in 2018 to include the work of the art students at St. John the Evangelist Catholic School here in Hapeville. Three benches were refurbished to show the history and character of Hapeville. 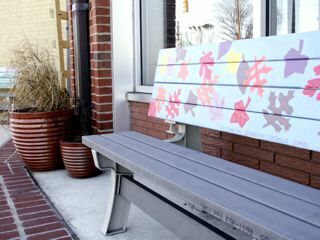 You can find these benches along North Central Avenue.